In her late forties, after a noisy upbringing and then adulthood as vocal feminist and mother, Sara Maitland found herself living in the country. She fell in love with the silence, and in this profound, frank memoir she describes how she explored this new love, searching for silence and solitude. Seeing as we seem to live in a world that regards silence as dangerous or unsettling, I found this to be a fascinating look through the eyes of a woman searching for a much quieter life as she grows older. And as she explores various settings to access her dream, she soon finds out that silence can mean so many things to so many people, and that there are different kinds of silence! I've noticed that as I've grown older I much prefer a quiet atmosphere which seems much more difficult to find in the modern world we live in which seems to want to bombard us with noise wherever we may find ourselves, and as the author goes to extreme measures to obtain the holy grail of silence it is interesting to see how her mind deals with the changes in her life and seems to respond in wonderful ways to enjoying the quiet thing in life! 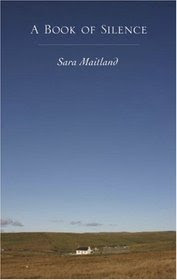 This book follows her as she moves to rural properties and takes trips on her own to see what kind of effect this has on her state of mind - she starts to enjoy the less frenetic pace of life, takes time to notice the little things in life and breaks free from being a 'slave to time' that we all often find ourselves trapped in. It touches on the importance of silence in religion, spirituality and the way that modern life seems to demand a noise is made! Even a minutes' silence now is often replaced by clapping- what is it about being quiet that scares so many people?! I found myself really connecting with the author and her discoveries along her journey, and she even touches on how spending too much time in silence can affect your mental health, the bad sides and the good! It was so interesting to see how she found even the simplest task of shopping after spending time being quiet, as the noise from a shopping mall or supermarket was just so amplified. It was also clear that silence means different things to different people. A really captivating look at such a simple subject and so much to think about in ways of getting that balance between living in a noisy world and taking time out to enjoy the peace and quiet!